Grove Components' Metric, UNC and UNF Value Packs represent exceptional value for money, and provide an excellent selection of the most common fastener sizes for use on any motor vehicle that employs UNF, UNC or Metric threaded fasteners. They represent a substantial saving over the cost of purchasing the contents as separate items. All contents are individually bagged and labelled to assist in identification of fastener sizes, and "top up" quantities of individual items are readily available. 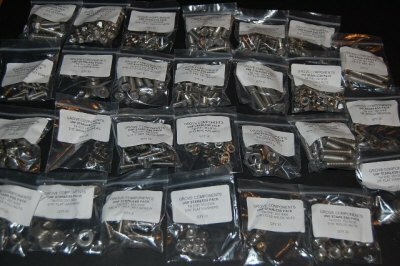 The 450+ Piece Stainless Steel Value Pack contains a consistent assortment of top-quality A2 (18/8) Austenitic stainless steel fasteners (having an 18% Chromium content and an 8% Nickel content) selected from our full retail range.Whether you are restoring a motoring classic or upgrading a modern vehicle, stainless steel fasteners not only look more attractive but also provide exceptional resistance to corrosion, ensuring that a concours-quality appearance will be maintained. The 400+ Piece Bright Zinc Plate Value Pack contains a consistent assortment of top-quality Grade 5 (8.8) high-tensile steel fasteners selected from our full retail range.